Elena Rebeca Gutiérrez is an Associate Professor in Gender and Women's Studies and Latin American and Latino Studies at the University of Illinois, Chicago. Dr. Gutiérrez earned her PhD in Sociology from the University of Michigan in 1999 and is a scholar of Latina/o reproductive and sexual health politics, feminism and social activism and Chicana/o Studies. She has recently received funding from the Migration and Health Research Program (PIMSA) for a collaborative, bi-national project to research the role of social networks in the reproductive health care that Mexican immigrant women in Chicago. She is also the principal investigator of the Sterilization Policy Project, which assess the current status of female sterilization informed consent protocols across the nation. 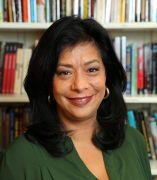 Her book publications include Undivided Rights: Women of Color Organize for Reproductive Justice with Jael Silliman, Marlene Gerber Fried, and Loretta Ross (Boston: South End Press, October 2004) which received the 2005 Gustavus Myers Outstanding Book Award in the area of bigotry and human rights, and Fertile Matters:The Politics of Mexican origin Women's Reproduction (University of Texas Press, 2008). Fertile Matters documents the involuntary sterilization of Mexican-origin women in Los Angeles in the 1970s and illuminates the ways in which political, social and racial anxieties shaped the construction of the "problem" of Mexican origin women's fertility and reproduction. Dr. Gutiérrez has served on the boards of and worked as a consultant with the National Latina Health Organization, SisterSong Women of Color Reproductive Health Collective, the National Latina Institute for Reproductive Health, and Mujeres Latinas en Acción.